One day last month I realized I was homesick. 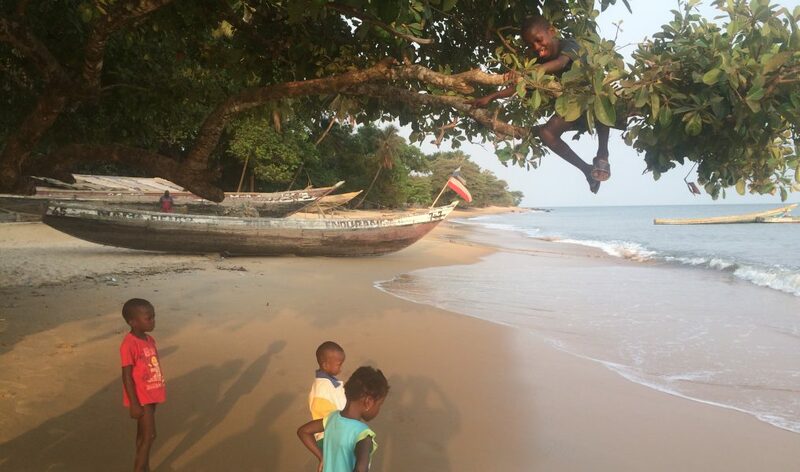 Now I have been in West Africa for four years, you would think I would be over homesickness by now. But nonetheless I realized I really missed America. What made it even more bizarre is why. I missed Christmas. I missed the lights, the store displays, the music, the movies, the programs, the concerts and even the parties. This is the original Grinch talking here, just ask Bekki. It bugged her to no end as I would bah-humbug my way through the holidays, until the last week when suddenly I went all in. Julian putting our up our 32 year old Christmas tree. But Christmas, even though it is a national holiday, does not exist here, not really. I did see some lights on a partly constructed building coming back from the airport the week before Christmas, but that is it. 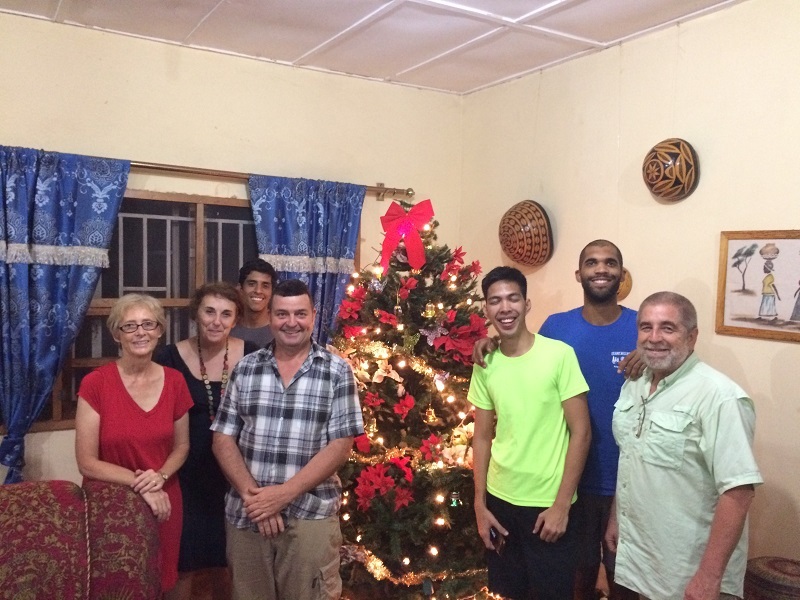 We have done our best to overcome this deficit, we had the volunteers up and had a Christmas tree decorating party, I have tried to play Christmas music when I could get the electronics to work, we hung the stockings with care, even on the elephant’s trunk. But, alas, it is just not the same when you are all alone in your festive spirit. 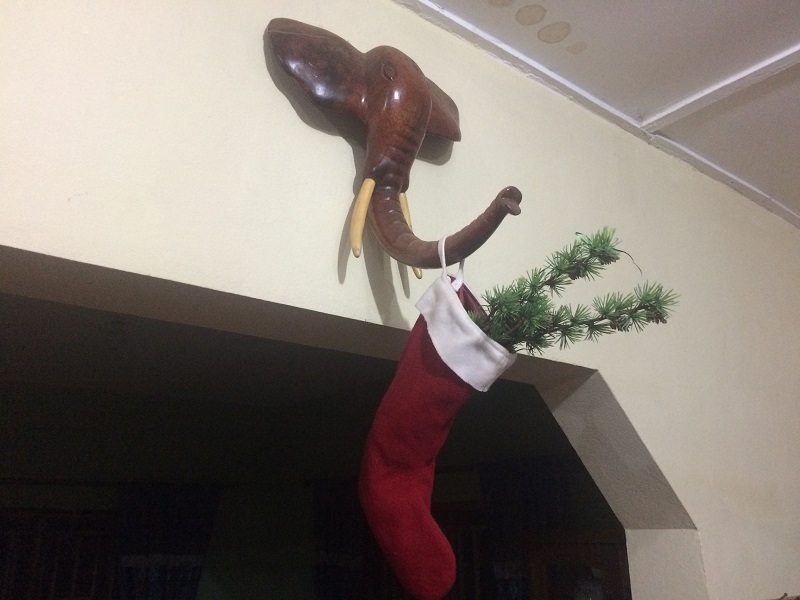 Even the Elephant head has it’s own stocking. The gang at the Christmas Tree Party, Bekki, Ian and Heather, Julian, Eric, JP, and Dr. Donn Gaede. The Adventists here don’t do Christmas, I was told. The other Christians do, just not the Adventists. The Muslims are obviously not really into it either. But for us Adventists it means no Christmas carols at church, minimal if any decorations, and certainly no mention of it. (On the Sabbath before Christmas I did preach on the Magi, however.) It all added up to a homesick missionary longing for Bing Crosby and Danny Kaye, dreaming of a White Christmas. Finding myself in a bit of a snit, I decided to find out why Adventists don’t celebrate Christmas. The answer was not what I expected. It is simply that we don’t know that Jesus was born on December 25 so why should we celebrate Christmas? I also heard that Christmas is too materialistic and commercialized as the other reason. But the main one is that Jesus was almost certainly not born on December 25. As I pondered this I became more and more annoyed. First, I don’t like the logic. I will grant you Jesus was almost certainly not born on December 25, truth is we don’t know when. So, the logic here is, if we don’t know the date, let’s throw the whole thing out and ignore it. My logic says that since we don’t know the date, pick one, and December 25 happens to be very convenient because literally the whole world is celebrating and talking about the birth of our Savior. So what if you don’t like the commercialism, then don’t do the gift exchange thing, but what an evangelism opportunity. Everyone is at least thinking a little about Jesus, between eggnog and wrapping presents, so capitalize on it. Don’t just ignore it. Everyone already thinks we are practically Jews because we go to church on Saturday, this is not helping convince them we are Christians too. That was my logic and my rather convincing argument, or so I thought. I tried it out on a few of my Sierra Leonean SDA friends. I didn’t get very far. They thought my logic was senseless. I thought their logic was senseless. We are still friends because we could agree to disagree. To my credit, even though I was annoyed, I dropped it. When in Sierra Leone do as the Sierra Leoneans do, the Adventists at least, that’s my motto. Two nights ago I was leaving the hospital to head home and a short, well dressed older man stopped me asking for Dr. Koroma. I told him Dr. Koroma was on leave until February, could I help him? We were in the back so he asked about the lab/pharmacy building. I explained what it was and then pointed out the chapel currently under construction, surreptitiously patting myself on the back as I am rather proud of our construction projects. “The chapel is just for Seventh-day Adventists?” he asked. “No, it is for all faiths, even Muslims”, was my reply. He then proceeded to quote scripture to me, “Remember the seventh-day Sabbath of the Lord your God.” I was pretty impressed. This man was obviously well educated, or at least well read. I didn’t recognize him, so I asked if he was Christian. No, he is Muslim he told my quite proudly. It was at this point that he dropped the bombshell. “Why do Christians celebrate Christmas when they know that is not Jesus birthday?” he asked. Going on he pointed out that at least Muslims know Mohamed’s birthday. I was ready, had my argument all primed and loaded. Had him. There is just no beating that kind of logic. Unless you are West African. We spent the next five minutes going back and forth, basically repeating our arguments, but getting nowhere. He had me, I had him, but we were playing in two different worlds. But, I had an ace in the hole, if you don’t mind my mixed metaphors. 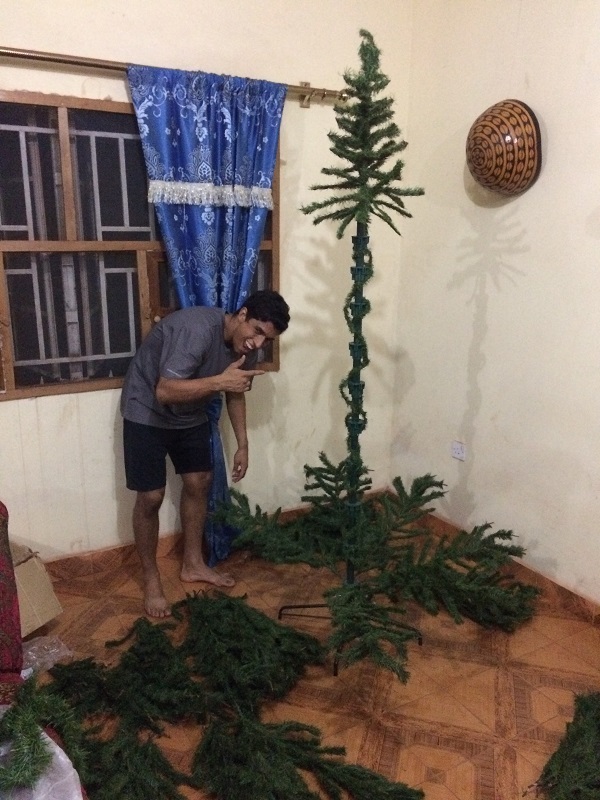 “Seventh-day Adventists don’t celebrate Christmas,” I told him triumphantly. I looked over at Pa Cole who was sitting there quietly, probably loving every bit of this interchange. “It’s true, we don’t celebrate Christmas for that very reason.” Pa Cole backed me up. The man’s entire demeanor changed. These were Christians he could understand, Christians he could relate to. None of this crazy American idea of just pulling any date out of thin air to celebrate the birth of your sect’s prophet. And the crazy American understood. It’s their culture, it’s their logic, and it gives us one more part of the bridge between Christianity and Islam. I am still homesick for Christmas, and the first Christmas I am back home I am going to go nuts, we are going to drive around and look at the lights, we are going to watch Christmas movies, go to hear the Messiah, go to school programs, attend every Christmas party we get invited to. I told Bekki I am getting a 25 foot tree. But now I see that for this culture where the logic is different (not wrong, just different) and there is such a strong Muslim influence, the Adventists here have a valid point.